A chronological day-by-day history of Volvo. The trademark Volvo (which is Latin for I roll) was first registered by the ball bearing maker SKF, with the intention to use it for a special series of ball bearing for the American market (however in the application for the trademark, it was also designated for the purpose of automobiles), but it was never used for this purpose. SKF trademark as it looks today was used instead for all the SKF-products. Some pre-series of Volvo-bearings stamped with the brand name 'Volvo' were manufactured but was never released to the market and it was not until 1927 that the trademark was used again, now as a trademark and company name for an automobile. When Volvo AB was introduced on the Swedish stock exchange in 1935, SKF sold most of the shares in the company. Volvo Cars was owned by AB Volvo until 1999, when it was acquired by the Ford Motor Company as part of its Premier Automotive Group. Geely Holding Group then acquired Volvo Cars from Ford in 2010. John "Jack" Mack, who co-founded what would become one of North America's largest makers of heavy-duty trucks, was killed when his car collided with a trolley in Pennsylvania. In 1890, Jack Mack went to work for Fallesen & Berry, a carriage and wagon company in Brooklyn, New York. Three years later, Mack and his brother Augustus bought the business. In 1900, the siblings founded the Mack Brothers Company and began making motorized vehicles. In 1905, they began producing trucks in Allentown, Pennsylvania, where the company continues to be headquartered today. In addition to trucks, the business built buses and railway cars. In 1910, Mack Brothers developed the first motorized hook-and-ladder fire truck for Morristown, New Jersey. After the brothers sold their company to investors in 1911, it continued to flourish, and during World War I, Mack built thousands of trucks for the American and British governments. The company acquired its trademark bulldog logo when British soldiers said the truck’s blunt-nosed hood and durability reminded them of their country’s mascot, the bulldog. In 1922, the year Jack Mack died in a car crash, the company was renamed Mack Trucks Inc. In 2001, Mack was acquired by Volvo of Sweden. Today, Mack trucks are sold in over 45 countries worldwide and the expression “it hit me like a Mack truck” (meaning something that creates a powerful impact) is part of the American lexicon. AB Volvo occupied the former Nordiska Kullagerfabriken factory in Hisinngen, Sweden for the purpose of automobile manufacturing. The first regular production Volvo, the "Öppen Vagn 4 cylindrar" (OV4), nicknamed "Jakob," left the assembly line in Goteborg, Sweden. Volvo (“I roll” in Latin) was the result of collaboration between Assar Gabrielsson and Gustaf Larson. When the first series produced ÖV4 was about to drive out of the factory and engineer Eric Carlberg put it into first gear, the car went backwards, where the car was actually in reverse gear. The explanation was that the differential gear in the rear axle had been fitted incorrectly. This mistake delayed the introduction by one day and the official introduction day for the ÖV4 was then adjusted to 14 April 1927, the day AB Volvo officially says the automobile company Volvo was "born". The OV4's 1,944cc side-valve engine made 28hp, while the transmission was a three-speed and the brakes were mechanical and acted on the rear wheels. Of the ten prototype cars Volvo built, nine were open touring cars, and one was a closed sedan, the PV4 (Person Vagn, or passenger car, 4-cylinders). All used the “iron” or “Mars” symbol on their radiator shell to signify the famous Swedish iron and steel that this Swedish car was made from; the diagonal slash that bisected the radiator to fix the symbol in place was simply the easiest way to hold it there, but it became the automaker’s signature marking. 1927 Volvo OV4 "The Jakob"
The first production line Volvo, the 20 hp OV4, costing 4,800 kroner went on view in Stockholm, Sweden. It was displayed at the premises of Ernst Graugers at Brukenbergstorg and aroused great interest. The engine was designed by Gustav Larson and its main chassis components by Jan G. Smith, a designer who had worked many years in the American automobile industry and returned to Sweden in 1924. Many of Jan G. Smith's original drawings for the ÖV4 and other technical papers that he collected in America are saved in the archive of the National Museum of Science and Technology in Stockholm, Sweden. When the first series produced ÖV4 was about to drive out of the factory and engineer Eric Carlberg put it into first gear, the car went backwards, where the car was actually in reverse gear. The explanation was that the differential gear in the rear axle had been fitted incorrectly. This mistake delayed the introduction by one day and the official introduction day for the ÖV4 was then adjusted to 14 April 1927, the day AB Volvo officially says the automobile company Volvo was "born"— this is from a marketing point of view. The company as an automobile company was born as a subsidiary company to SKF on 10 August 1926. The cabriolet was not very successful in the Swedish climate; the covered version, PV 4, was introduced in the end of 1928. Between 1927 and 1929 a total of 996 cars were manufactured. Almost exactly two years since the first Volvo car was produced, the company launched its second model, the 55 hp Volvo PV651 – PV stood for Private Vehicle while the number 651 indicated 6 cylinder, 5-seater, and was the first of the series. The new car had a stronger chassis to cope with the more powerful engine. The bodywork was manufactured in the traditional way, with a wooden frame covered with steel plates. The 3010 cc DB engine was very robust and its crankshaft was supported by seven main bearings. It had a non-synchromesh 3-speed box. The DAF company was founded when a machine construction company led by Huub and Wim van Doorne, changed its name to Van Doorne's Aanhangwagen Fabriek (Van Doorne's Trailer Factory), abbreviated DAF. In 1949, the company started producing trucks and buses, changing its name to Van Doorne's Automobiel Fabriek (Van Doorne's Automobile Factory). In 1958, DAF produced its first passenger car with a continuously variable automatic transmission, the Variomatic. The division of DAF producing passenger cars was sold to the Swedish company Volvo Cars in 1975, leaving DAF to concentrate on its successful line of trucks. The car factory is currently 100% owned by Mitsubishi and is known as Netherlands Car B.V or NedCar. The 100,000th Volvo car - a black PV444 - came off the assembly line at the Lundby plant, Sweden. The PV444 was Volvo's first uni-body car. Its body structure was influenced by the 1939 Hanomag 1,3 litre, which was purchased and studied by Volvo engineers. It was also the first Volvo in almost 20 years to come with a 4-cylinder engine. The first PV444s were powered by a 40 PS 1.4 L inline-four engine designated the B4B, with three main bearings, overhead valves, and a single downdraft carburettor. The power of this engine increased to 44 PS (32 kW) in October 1950, and to 51 PS (38 kW) in October 1955. US models, beginning to appear in the US in early 1956, received an uprated version called the B14A which was given twin side-draft 1½ in S.U. carburetors for a total of 70 hp. Most early US sales were limited to Texas and southern California. American customers also had the option of European delivery, in which case they could also get a cheaper model with the basic B4B engine. By the 1957 model year, engine displacement was increased to 1.6 L and both single downdraft- B16A and twin side-draught carburetted B16B versions were offered. Fuel economy was quite above average for cars sold in the United States. The average American car gas mileage in 1957 according to SAE papers was 12 miles to the gallon. The Volvo PV444 averaged 25 miles to the gallon US and performance particularly with the twin carburetor configuration was brisk. The combination of performance and durability won over many two-seat sports car drivers, allowing them a pleasurable drive in the entire family's company if desired. The Volvo PV445, basically a PV444 chassis on which a speciality body could be mounted, was introduced. From 1949 to 1953, the PV445 formed the base for small lorries, vans, estate cars and a few beautiful drophead-coupé convertible) cars. None of these were built by Volvo, but by independent coachwork firms. In 1953, the famous Duett (variant DH) was introduced, based on the PV445. This became legendary, and is the ancestor of today's exclusive, comfortable, safe and powerful Volvo estate cars. The first Volvo Duett 445 DH was built for delivery to the first customer for this estate model, none other than one of Volvo’s founders, Assar Gabrielsson. A few months later the first van version was produced and designated as the Volvo PV 445 DS. The design was based on the Volvo PV sedan and shared its engine and front suspension with that model. However, unlike the PV, which had a unibody design and a coil spring rear suspension, the Duett used a ladder frame with leaf springs supporting the rear. While the Duett has been criticized as a regressive design by those who point out that the ladder-frame car was based on Volvo's first unibodied car; the use of a separate ladder chassis provided Volvo with an easy solution in their desire to produce a suitable commercial vehicle. The availability of the bare chassis also allowed Swedish coach builders such as Grip, Valbo and Nordbergs to build Duett-based pickup trucks, convertibles and specialized commercial vehicles. The versatility of the ladder-frame design also made the Duett a popular choice as a base for customized vehicles such as hot rods and EPA tractors. The Duett was the only automobile marketed by Volvo in the United States that used a separate frame. All other models were of unibody construction. The first Volvo sports car, the two-door, two-seater, open-top P1900, produced for export only, was unveiled with great fanfare at Torslanda Airport near Gothenburg, Sweden. Capable of 85 mph, the 3-gear, 4-cylinder, 1,414-cc car, fitted with twin SU carburettors, was a financial disaster – only 67 cars were ever sold. The first Volvo 445PH estate car was produced. The 100,000th Volvo PV444 was produced. The PV444 was Volvo's first uni-body car. Its body structure was influenced by the 1939 Hanomag 1,3 litre, which was purchased and studied by Volvo engineers. It was also the first Volvo in almost 20 years to come with a 4-cylinder engine. The first PV444s were powered by a 40 PS 1.4 L inline-four engine designated the B4B, with three main bearings, overhead valves, and a single downdraft carburettor. The power of this engine increased to 44 PS (32 kW) in October 1950, and to 51 PS (38 kW) in October 1955. US models, beginning to appear in the US in early 1956, received an uprated version called the B14A which was given twin side-draft 1½ in S.U. carburetors for a total of 70 hp. Most early US sales were limited to Texas and southern California. American customers also had the option of European delivery, in which case they could also get a cheaper model with the basic B4B engine. By the 1957 model year[vague], engine displacement was increased to 1.6 L and both single downdraft- B16A and twin side-draught carburetted B16B versions were offered. The Volvo Amazon was introduced. The mid-size car was manufactured from 1956 to 1970 and introduced in the USA as the 122S at the New York International Auto Show in April 1959. It shared the wheelbase, tall posture and high H-point seating of its predecessor, the PV and was offered two-door sedan, four-door sedan, and a five-door wagon body styles. In 1959 Volvo became the world's first manufacturer to provide front seat belts as standard equipment — by providing them on all Amazon models, including the export models and later becoming the first car featuring three-point seat belts as standard equipment.When introduced, the car was named the Amason (with an 's'), deriving from the fierce female warriors of Greek mythology, the Amazons. German motorcycle manufacturer Kreidler had already registered the name, and the two companies finally agreed that Volvo could only use the name domestically (i.e., within Sweden), modifying the spelling to Amazon. Subsequently, Volvo began its tri-digit nomenclature and the line became known as the 120 Series. The Amazon was originally manufactured at Volvo's Lundby plant in Gothenburg and subsequently at the company's Torslandaverken plant, which began operating in 1964. By the end of production, 234,653 four-door models, 359,917 two-door models and 73,220 station wagons had been produced, of which 60% were exported; for a total of 667,791 vehicles. Volvo launched its ‘50th anniversary car’, a special version of the Volvo 244DL in a metallic silver finish with black and gold decorative trim. The interior was finished in plush blue upholstery and the glove compartment bore a silver plaque engraved with the text “Volvo 1927-77, Anniversary Car”, and the President of Volvo Pehr G Gyllenhammar’s signature. Unfortunately however, the enamel was of poor quality and the badges deteriorated. The last Volvo Sport 2-seat sports cars was produced. When Volvo presented an open 2-seater sports car with a body made of fibreglass-reinforced polyester in 1954, it was something of a sensation. However, the car did not go into production until 1956 and, after a great many problems, production was wound up in 1957. By this time, 67 cars had been built. The original idea was that this car would only be for export. A convertible was not regarded as wholly suitable for the Swedish climate. However, in spite of this, most of the cars were sold on the domestic Swedish market. The car was based on standard components, mainly from the Volvo PV444, but it was built on a separate tubular frame. The engine was a developed version of the 4-cylinder, 1.4-litre engine from the PV444. Using twin carburettors, a different camshaft, larger intake valves and higher compression, the engine of the Sport developed 70 bhp. This 70 bhp engine was also used in the 1957 Volvo PV444 destined for the US market. It gave the PV444 good performance and the model was sold as 'The family sports car' but was far too expensive in relation to the competition. The Volvo PV544 was introduced, replacing the PV444. Subtle differences from the PV444 included the introduction of a curved one-piece windshield to replace the two panes of flat glass, larger taillights, and a ribbon-type speedometer. The PV544 added a 4-speed manual transmission to replace the 3-speed unit that had been in the 444. The last Volvo PV445 chassis was produced. The last Volvo P2101 chassis was produced. Assar Gabrielsson (70), co-founder of Volvo cars died. He held a bachelor's degree in economics and worked as a sales manager with bearing manufacturer SKF in Göteborg in the early 1900s. He was employed in 1916 by Björn Prytz at the sales department and was appointed sales manager for the entire SKF company group on June 20, 1922. He held that position until the new automobile company AB Volvo was founded as a subsidiary company within the SKF company group. The US Patent Office issued a patent for a three-point automobile safety belt "for use in vehicles, especially road vehicles" to Swedish engineer Nils Bohlin. In 1958, Sweden's Volvo Car Corporation had hired Bohlin, as the company's first chief safety engineer. At the time, safety-belt use in cars was limited mostly to race car drivers using a traditional two-point belt, which fastened in a buckle over the abdomen. This was shown to cause severe internal injuries in the event of a high-speed crash. Bohlin designed his three-point system in less than a year, and Volvo introduced it on its cars in 1959. Consisting of two straps that joined at the hip level and fastened into a single anchor point, the newer system significantly reduced injuries by effectively holding both the upper and lower body while reducing the effect of the swift deceleration that occurred in a crash. The Marcos GT was presented at the 1963 Earls Court Motor Show. The chassis was constructed from wood clothed in a glass fibre shell. With a low roof line and a long sleek long bonnet it was reminiscent of the E-type Jaguar and Ferrari GTO. It had a Volvo 1800cc engine and De Dion sophisticated rear suspension. Production costs were high and this changed in 1966 to a more conventional suspension and a Ford V4 engine, and optional more powerful Ford V6 and Volvo 3 litre straight 6 achieving speeds in excess of 120 mph. The export version to North America used the Volvo engine for exhaust emission regulations. The Vanden Plas Princess 1100d was shown to gauge public reaction. The Show car was converted by hand from an MG1100, with luxury equipment including a burr walnut-veneer dashboard, housing two round instruments, door cappings and picnic tables; Connolly hide upholstery, Wilton carpets and West of England cloth headlining. United States President Lyndon B Johnson and Canadian Prime Minister Lester Pearson signed the United States & Canada Automotive Trade Agreement. It removed tariffs on cars, trucks, buses, tires, and automotive parts between the two countries, greatly benefiting the large American car makers. In exchange the big three car makers (General Motors, Ford, and Chrysler) and later Volvo agreed that automobile production in Canada would not fall below 1964 levels and that they would ensure the same production-sales ratio in Canada. Before the Auto Pact the North American automobile industry was highly segregated. Because of tariffs, only three percent of vehicles sold in Canada were made in the United States, but most of the parts were manufactured in the U.S. and overall Canada was in a large trade deficit with the States in the automobile sector. The Pact caused vast and immediate changes. Canada began to produce far fewer different models of cars. Instead, much larger branch plants producing only one model for all of North America were constructed. In 1964, only seven percent of vehicles made in Canada were sent south of the border, but by 1968, the figure was sixty percent. By the same date, forty percent of cars purchased in Canada were made in the United States. Automobile and parts production quickly surpassed pulp and paper to become Canada's most important industry. From 1965 to 1982, Canada's total automotive trade deficit with the U.S. was $12.1 billion; this subsumed a surplus of around $28 billion worth of assembled vehicles and a deficit of around $40.5 billion in auto parts. The two nominal goals of APTA were to reduce production costs in Canada by dint of more efficient production of a smaller range of vehicles and components, and to lower vehicle prices for consumers.The agreement is said to have benefitted Canadian workers and consumers by dint of lowered prices and increased production creating thousands of jobs and increasing wages. These newly created jobs were highly localised to southern Ontario, with little employment benefit to the rest of Canada. The jobs created by the new market conditions under the pact were almost exclusively blue collar; administration, research and development remained in the United States. This transfer of control of Canadian automaking operations to their US parent corporations substantially reduced the autonomy of the Canadian operations with respect to vehicle and component specification, design, and sourcing; manufacturing and production, branding and marketing, corporate policy, etc. The agreement also prevented Canada pursuing free trade in automobiles elsewhere internationally, and this North American exclusivity led Transport Canada to adopt the technical regulations of the U.S. National Highway Traffic Safety Administration rather than participating in the European-based development of international consensus on auto safety and emissions regulations. The Auto Pact was abolished in 2001 after a World Trade Organization ruling declared it illegal, though by that time the North American Free Trade Agreement had effectively superseded it. The last PV544 was driven off the Volvo assembly line at its Lundy plant in Sweden by long-time Volvo test driver Nils Wickstrom. Gustaf Larson, the engineer who had co-founded Volvo with businessman Assar Gabrielsson in 1927, was present at the ceremony. An impressive total of 440,000 Volvo PV544s had been produced during its eight-year run, over half of which had been exported. The Volvo PV544 was first introduced in 1958 as an updated version of its popular predecessor, the PV444. Like the PV444 with its laminated windscreen, the PV544 featured an important safety innovation; it was the first car to be equipped with safety belts as standard fitting. But the PV544 was also a powerful automobile, boasting a 4-speed manual transmission option and power up to 95bhp. Shortly after its introduction, the 544 became one of the most successful rally cars, dominating rally racing into the 1960s. Yet, the PV544 was also affordably priced, and its first-year sales put Volvo over the 100,000-exported automobiles mark. By the end of its run, the PV was old-fashioned–looking—the company had made very few cosmetic changes in the two decades the car had been on the market—but it remained a good, solid automobile. "Above all," Road & Track magazine said in 1963, "the Volvo PV544 is such a practical car. Volvo's most attractive appeal lies in its solidity and its quality in every single respect. There is nothing slapdash or under-dimensioned about any part of the car and that is more than enough to compensate for any perceived lack of glamour." Irvin Gordon bought his P1800 at a neighbourhood Volvo dealership for $4,150 and has driven the vehicle over 2 million miles. He has held the Guinness World Records mark for High Mileage Vehicle since 2002 and was the first person to hold that record. The first British Drag Racing Championship began at the Santa Pod Raceway, England. This meeting saw the use of handicapped starts for the first time and in the dragster division final Tony Gane hung on to a 2.1 second advantage in his 500cc Rudge engined Wicked Lady, to beat Les Turners blown 1500cc dragster. One of Tonys crew members was a teenager by the name of Dennis Priddle. In the Dragster divisions Allan Herridge took his Cadillac powered rail to a new B class speed record of 129.37. Tony Densham set a new Class E E.T. record of 12.672 in 'The Worden' and J. Fisher set a new F class speed record of 96.58mph in his BMC powered machine. D. Farrell set a new B class Competition Altered E.T. record of 12.980 seconds. In the Sports & GT section G. Tyack took his Cobra to a new E.T. record of 12.750 in the C class. Modified Production saw four new records set. A. Wemyss set a new class B speed record of 107.64 in his Dodge, E. Ellis took his Ford to a new D class E.T. record of 15.617 and B. Harvey took his lotus Cortina to set both ends of the E class record at 16.692/81.97. Production saw J. Watcher set a new B class E.T. record of 14.376 followed by a new speed record of 95.84, while R. Duffell took his Volvo to a new E class speed record of 66.84. The last Volvo Amazon was produced. When introduced in 1950, the car was named the Amason (with an 's'), deriving from the fierce female warriors of Greek mythology, the Amazons. German motorcycle manufacturer Kreidler had already registered the name, and the two companies finally agreed that Volvo could only use the name domestically (i.e., within Sweden), modifying the spelling to Amazon. Subsequently, Volvo began its tri-digit nomenclature and the line became known as the 120 Series. The Amazon was originally manufactured at Volvo's Lundby plant in Gothenburg and subsequently at the company's Torslandaverken plant, which began operating in 1964. By the end of production, 234,653 four-door models, 359,917 two-door models and 73,220 station wagons had been produced, of which 60% were exported; for a total of 667,791 vehicles. The Amazon sedan's ponton genre, three-box styling was inspired by US cars of the early 1950s, strongly resembling the Chrysler New Yorker sedan and the Chrysler 300C hardtop Coupe. According to designer Jan Wilsgaard, the Amazon's styling was inspired by a Kaiser he saw at the Gothenburg harbour. The Amazon featured strong articulation front to rear, pronounced "shoulders", and slight but visible tailfins. These features became inspiration for Peter Horbury when reconceiving Volvo's design direction with the V70 after decades of rectilinear, slab-sided, boxy designs.The Amazon's bodywork was constructed of phosphate-treated steel (to improve paint adhesion) and with heavy use of undercoating and anti-corrosive oil treatment.Original specifications for the Amazon included the new Volvo B16 engine, a 3-speed manual gearbox (H6) and rear-wheel drive. In 1958 the sport model, Amazon Sport, was released and later the same year the Amazon became the first series produced car with a three-point safety belt in the front seats as standard. In 1962, Volvo introduced a two-door version, a five-door wagon, and the new B18 engine, deleting two-tone paint and upholstery. In 1965 the Amazon color-coordinated embossed vinyl upholstery and door panels became available. The new gearbox selections were the three-speed M30 (briefly offered with an automatic electric clutch), the four-speed M40 and the M41 with four-speed and overdrive. The M31 gearbox was also introduced in 1961 but was only available that year (a three-speed fully synchronized gearbox with overdrive on both second and third direct gears). Gearbox options on the 121 were the M30, M31 and M40 while gearbox options on the 122S were the M40 and M41 gearboxes. In 1964 the Borg-Warner BW35 three-speed automatic transmission also became available on the four-door and two-door.The station wagon (estate) version was introduced at the 1962 Stockholm Auto Show, and Volvo manufactured 73,000 examples between 1962 and 1969. The Amazon estate featured a two-piece tailgate, with the lower section folding down to provide a load surface and the upper section that hinged overhead. The vehicle's rear license plate, attached to the lower tailgate, could fold "up" such that when the tailgate was lowered and the vehicle in use, the license plate was still visible. This idea was used by the original 1959 Mini. In recent years a similar arrangement was used on the tailgate of the Subaru Baja. The Amazon platform was used as the basis for the P1800 and 1800ES. The last Volvo 1800E sports coupe was produced. At 2.00 pm the last Volvo P1800 rolled off the production line at the Lundby car plant in Sweden. The 1986 cc, 135 hp, 4 cylinder ES model with a top speed of 115 mph (185 km/h) and capable of accelerating from 0 to 100 km/h (62 mph) in 10.8 seconds, was made famous by Simon Templar (Roger Moore) in the TV series The Saint. The first 6,000 cars, produced in 1961 were assembled at Jensen Motors of West Bromwich, West Midlands and shipped to Sweden. AB Volvo purchased a controlling interest in Van Doorne's Personenautofabriek Daf B V., the Dutch manufacturers of the compact DAF featuring the unique 'Variomatic' transmission. A merger between Volvo and Saab was proposed, but failed to materialise. The merger of Volvo and Saab was called off. Ken Langley and Garry Sowerby crashed their Volvo DL wagon through a red-and-yellow paper finish line and into the record books for the fastest-ever drive around the world. With Sowerby at the wheel and Langley navigating, the 'Odyssey 77' team drove through 24 countries across North America, Australia, Europe and Asia. They had to drive the equivalent length of the Earth's equator -- 24,901.55 miles. The two Canadians arrived at the CN Tower in Toronto, Canada at 2:11 p.m. EST -- 74 days and 51 minutes after their September 6 departure, three days ahead of schedule. They drove 26.893.75 miles (43,030 kilometres) to eclipse the previous mark of 102 days set by American Johnnie Parsons in 1976. They conquered Australia's desolate outback, India's tropical jungles and the arid semi-deserts of Pakistan. They drove through five communist nations, bathed on the sunny beaches of Monaco and southern Spain, and stood on the Arctic Circle in swirling snow at Rovaniemi in Finnish Lapland. The Volvo had only minor mechanical problems. In the rugged outback, dust penetrated the voltage regulator, a flying rock cracked the windshield and a rangy kangaroo dented the fender in a losing, fatal game of chance. A sharp rock pierced a front tire when they slipped off a flooded road in India and a front shock collapsed on a washboard secondary road in Sweden. Pietro Frua (70) was one of the leading Italian coachbuilders and car designers (AC Frua, Maserati Mistra, Glas GT) during the 1950s and 1960s, died. Frua's professional career began at the age of 17, when he joined Stabilimenti Farina as a draftsman. At the age of 22, he became Director of Styling at the Stabilimenti Farina, already a leading Turin coachbuilder employing several hundred people. Some credit him with having influenced early designs of the iconic Vespa while at Farina. That was where Frua had his first contact with Giovanni Michelotti, who became his successor as Head of Styling after he started his own studio in 1938. During World War II car-styling work was scarce and Frua had to turn to designing children’s cars, electric ovens and kitchen units, as well as a monocoque motorscooter. Frua planned for post-war times: in 1944 he bought a bombed-out factory, hired 15 workers (including Sergio Coggiola, who founded his own carrozzeria in 1966) and equipped himself to design and build cars. 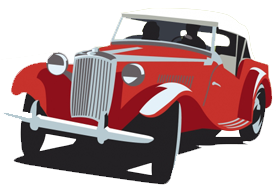 His first known car is a 1946 Fiat 1100C spyder. Maserati was one of the first clients who contracted Frua for the styling of their new 2-litre, 6-cylinder sports car, the A6G. From 1950 to 1957, Frua built 19 Spyders and seven coupés in three different design series – including some on the A6 GCS racing chassis. In 1957, Frua sold his small coachbuilding company to Carrozzeria Ghia in Turin, and Ghia director Luigi Segre appointed him head of Ghia Design. In this short period, Frua was responsible for the successful Renault Floride, which experienced well-deserved commercial success (about 117,000 were sold in ten years). This success led to a disagreement between Segre and Frua over the car’s “paternity”, and Frua left Ghia to start his own design studio again. At the same time, Pelle Petterson designed his Volvo P1800 under the attentive eye of Frua and, not surprisingly, it is often attributed to Frua's pen. From 1957 to 1959, Frua also designed several cars for Ghia-Aigle, the former Swiss subsidiary of Ghia Turin, already independent at that time. Giovanni Michelotti was his predecessor in this position. After Ghia-Aigle finished coachbuilding, a former employee, Adriano Guglielmetti, started his own business and founded Carrosserie Italsuisse in Geneva. Again Pietro Frua did the drawings and, most probably, built all the prototypes for this company. After a Corvair-like styled pontoon-Beetle in 1960, Italsuisse showed a Maserati 3500 GTI Coupé on the Italsuisse stand at the 1961 Motor Show in Geneva, together with two tasteful bodies on Studebaker chassis. In 1964 a lovely little Spyder followed with Opel Kadett mechanics. During the 1960s Pietro Frua was among the most prominent car designers in Italy. The “Frua line” was synonymous with the good taste of a single man. He followed each car’s realization to the last detail of fully functional one-offs and prototypes, often driving them to their presentation at the motor shows in Europe. Taking a different path toward promoting its products, Volvo displayed a crashed sedan at the 1985 Chicago Auto Show. The Swedish automaker was well known for its emphasis on safety, including crashworthiness. Even Ferrari had something new in Chicago that year: a sleek Testarossa, easily identified by the six long horizontal strakes along its bodysides. The Testarossa first appeared at the Paris Auto Show, late in 1984. Volvo Car Corporation unveiled the result of yet another cooperation in the field of luxury between Sweden and Italy, the Volvo 780, designed and built by Bertone in Turin at Geneva Motor Show. The Volvo 480 coupé exhibited at the 1986 Geneva Show clearly illustrated the revival of the Swedish make. Its original bodywork with a huge rear hatch made it a practical sports car that could also accommodate 4 passengers and their luggage. The 4 cylinder overhead camshaft engine was injection-powered and Volvo also announced the future release of a supercharged version with Garrett providing the turbo system. Goran Eliasson of Boras, Sweden achieved 88.87 mph on two wheels of a standard Volvo 760 at Anderstop. Renault and Volvo signed an agreement of industrial cooperation, outlining plans for an eventual merger. The merger plans were abandoned three years later, leaving a lot of unanswered questions and speculations. Many industry experts suspect that Volvo backed out of the deal due to their lingering suspicion of the French government. Renault, a state-owned company, was slated for privatisation, but critics found the plans too vague and saw the French government as susceptible to pressure from its workers. Automakers Renault of France and Volvo of Sweden announced a merger; however, Volvo cancelled the deal the following December. The last Jaguar XJS, a blue 6-litre V12 coupe rolled off the line at Browns Lane. The ultimate incarnation of a run that lasted an amazing 115,413. The XJ-S was launched on 10 September 1975. The development of the car had begun in the late 1960s as project XJ27, with an initial shape set by Malcolm Sayer, but after his death in 1970 it was completed by the in-house Jaguar design team, headed by Doug Thorpe. Power came from the Jaguar V12 petrol engine with a choice of a manual or automatic transmission, but the manual was soon dropped as they were left over from V12 E Type production. V12 automobiles were unusual at the time, with notable others coming from Italian luxury sports car makers Lamborghini and Ferrari. The specifications of the XJ-S compared well with both Italian cars; it was able to accelerate to 60 mph (97 km/h) in 7.6 seconds (automatic) and had a top speed of 143 mph (230 km/h). The first series of XJ-S cars had a Borg-Warner Model 12 transmission with a cast-iron case and a bolt-on bell-housing. In 1977 GM Turbo-Hydramatic 400 transmissions were fitted. The TH400 transmission was an all-aluminium alloy case with an integrated non-detachable bell-housing. When leaving the factory the XJ-S originally fitted Dunlop SP Super E205/70VR tyres on 15 × 6K alloy wheels, though British police forces would upgrade from this factory standard and fit a higher performing 205/70VR15 Michelin XWX to the Jaguars in their fleet. Jaguar's timing was not good; the car was launched in the wake of a fuel crisis, and the market for a 5.3-litre V12 grand tourer was very small. The styling was also the subject of criticism, including the buttresses behind the windows. German authorities feared these would restrict rearward vision, and refused to give the model (along with Lancia's similarly adorned Montecarlo model) type approval: it was for a time necessary instead for German XJS buyers to obtain type approval for each individual car when registering it. Such fears were ill founded, since in reality the rear visibility was very reasonable, with only the frontmost top edges of the buttresses being visible, when looking rearward. Jaguar did seize promotional opportunities with the television series The New Avengers and Return of the Saint. The New Avengers featured Mike Gambit (Gareth Hunt) who drove an XJ-S. Return of the Saint saw Simon Templar (played by Ian Ogilvy) driving an early XJ-S with the number plate "ST 1". Miniature versions were made by Corgi and proved popular. A decade and a half before, Jaguar had turned down the producers of the earlier Saint series when approached about the E-type; the producers had instead used a Volvo P1800. Goran Eliason achieved a record speed of 112.62 mph over a 100 metre flying start on the two wheels of a Volvo 850 Turbo at Satenas, Sweden. Eliason also set a speed record of 98.90 mph for the flying kilometer. The Ford Motor Co, confirmed the acquisition of the passenger car division of Volvo AB for $6.47 billion. Ford entered into a definitive agreement with AB Volvo for the purchase of Volvo's worldwide passenger car business for a price of $6.45 billion. Ford Motor Company purchased Volvo Cars for $6.45 billion, becoming part of Ford's Premier Automotive Group, which also included Aston Martin, Jaguar and Lincoln. Volvo Car Corporation formally announced the creation of Volvo CarSouth Africa (Pty) Ltd., (VCSA), to manage and develop its share of the South African prestige car market. The highest recorded mileage for a car is in excess of 2 million miles (3.2 million km) for a 1966 Volvo P-1800S owned by Irvin W Gordon. He reached the 2,000,000 miles mark on this day in the NBC Studios at Time Square, New York. Nils Ivar Bohlin (82), Swedish inventor of the three-point safety belt, died. Bohlin worked on the seat belt for about a year, using skills in developing ejection seats for SAAB; he concentrated on keeping the driver safe in a car accident. After testing the 3-point safety belt, he introduced his invention to the Volvo company in 1959 and received his first patent (number 3,043,625). Ten years later, he led the Central Research and Development Department for Volvo in 1969. In 1995 he received a gold medal from Royal Swedish Academy of Engineering Sciences and in 1999, was inducted into the Automotive Hall of Fame. He retired from Volvo in 1985 and was posthumously inducted into the National Inventors Hall of Fame. The new BMW Z4, Volvo S60R and V70R made their world debut at the Paris Motor Show. Volkswagen unveiled the striking new £22,000 Golf R32, the fastest production Golf ever built, to a crowd of waiting journalists at the NEC Motor Show. With a 3.2-litre engine developing a whopping 240 bhp, the Golf has an impressive top speed of 153 mph and could accelerate from 0 to 62 mph in a breathtaking 6.6 seconds. Rover Group unveiled the MG X80, whilst the DB7 GT, was the most powerful Aston Martin ever made. The stunning Bentley Continental GT won the Institute of Vehicle Engineers Motor Show Design ‘Car of the Show'. It beat the Jaguar XJ and Volvo XC90 to scoop the top award and also took the 'Best Luxury Car' award beating off close competition - again from the new Jaguar model. MG Rover Group announced a bold new extension to its small car range - the Streetwise. Based on the Rover 25, it had an increased ride height, chunkier bumpers and was aimed at a younger audience as an ‘urban on-roader'. The Rover Streetwise was an attempt by Rover to appeal to younger drivers. Rover had modernised the existing models in 1999 with a facelift for the 25, 45 and the Rover-designed 75 models but Rover was suffering falling sales and a tarnished brand after the sale of Rover to the Phoenix consortium in 2000 by BMW. Although new models were in the planning stages, the 25 and 45 models would be at least 10 years old before the new models were launched. Phoenix owned the rights to the MG brand, and had marketed the ZR, ZS & ZT with reasonable success, restyling the existing 25, 45 and 75 models. This included tweaked suspension, new wheels, altered dashboard inserts, different seats, and bodykits. With the MG brand proving popular, MG Rover Group turned their attention to the Rover brand. The Rover-badged cars had a rather staid image, and were commonly associated with elderly motorists. Thus, MG Rover attempted to appeal to a younger market. MG Rover decided to design a car for a niche market, and chose the ‘Urban on-roader’ look, similar to the Audi A6 Allroad, Škoda Octavia Scout, Volvo XC70 & Volkswagen Polo Fun/CrossPolo. The Streetwise ceased production in April 2005, when Rover ceased trading and went into administration. The all-new Volvo S40 saloon made its UK debut at the Scottish Motor Show in Glasgow. The Koenigsegg CCR supercar built in Italy, but produced in Sweden made its debut at the Geneva Motor Show. Pagnini unveiled the Zonda C 12 S supercar, while SEAT Altea made its world premier. Volvo made history in Geneva by unveiling the first concept car designed totally by women. Called the YC - for Your Car Concept, with new features that included Easy-Clean paint, door sills that rotated downward when doors open so legs didn’t brush against them, a sensor that told in advance if a parallel parking space was big enough for the car, an Autopark system that handled the steering to get the car into the space, and interchangeable, contoured front seat covers and floor mats that changed the interior look. Women "want everything male car buyers want and a lot more," said Hans-Olov Olsson, president and chief executive officer of Volvo Cars. The C70 model -- the first car built by the joint venture between Volvo Cars and Pininfarina (Pininfarina Sverige AB) sharing the Volvo P1 platform used in the S40, was presented. Designed by John Kinsey the coupé convertible featured a three-piece retractable metal hardtop that could be raised or lowered in less than 30 seconds. Swedish truck maker Volvo said it had successfully acquired Japan's Nissan Diesel, the latest merger in the industry as companies prepared for more stringent emissions rules. US auto giant Ford said it had agreed the main terms for selling its Swedish brand Volvo Cars to Chinese carmaker Geely. Zhejiang Geely Holding Group signed a binding deal to buy Ford Motor Co.'s Volvo Cars unit for $1.8 billion, representing a coup for the independent Chinese automaker which was aiming to expand in Europe. China’s Geely Holding Group received final government approval to acquire Volvo Cars from Ford Motor Co. in a $1.8 billion deal.